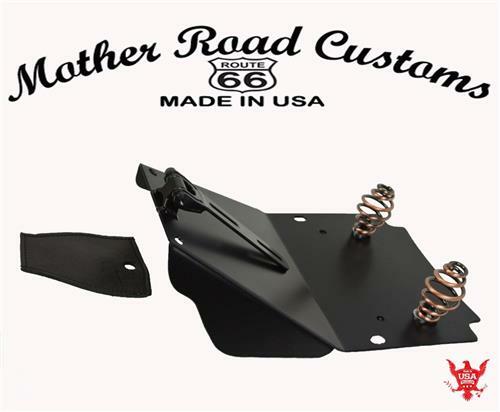 Fits All 1998-2018 Road King Models including Street Glide, Electra Glide, Ultra. This is a brand new Bolt On Spring Solo Seat Mounting Kit for the 1998-2019 Road King Touring Models!? Now 1998-2019 Road King owners can mount a spring solo seat to there bikes without modifications! The kit is easy to install.This spring kit will add more comfort to your ride and great styling as well. The kit has two sets of rear spring mounts availabe to use for ajusting the seat position for taller and shorter riders. It also allows you to mount smaller seats if you want like the 15x14" tractor seats. Seats are sold separately. Any of our seats will fit on this kit. The 17x16" tractor seat looks the best on the Touring models. Any of the other larger seats like the 11x16" and 15x14 tract will look good on the Road King kit.